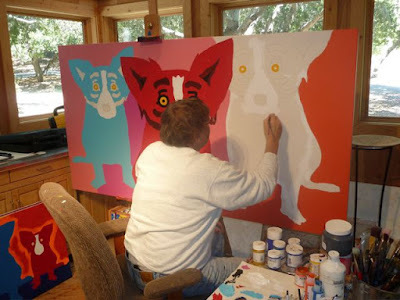 I spent this week watching George Rodrigue at his easel. Although I’ve seen him paint hundreds of canvases over the years, the process still amazes me, as he takes a blank canvas and turns it into something else. The subject is not a still-life he interprets or a posed model; rather, he invents something from thin air, painting what comes up inside of him, as opposed to the view from his studio window. “How do you know what you’re going to paint?” People ask him. Months ago I wrote about George’s Oak Tree paintings, specifically that he never painted an actual tree. Rather, even though he used both staged photographs and images from his mother’s album for the Cajuns, the trees, just like the Blue Dog, come from his head. And so I watch him, wondering Why this shape here, and why that color there? 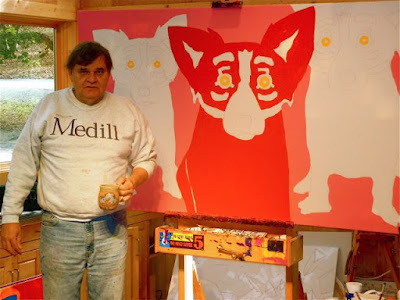 As the painting develops, I see not just the interesting design of the dog itself, but also the ones around the dog and between the shapes, so that there’s no real background or subject stronger than the whole completed picture. 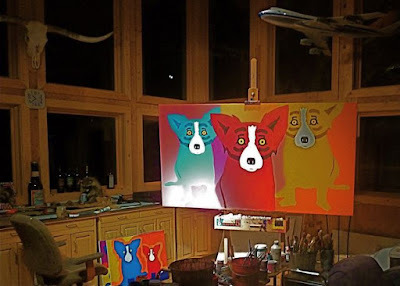 What seems at first like a mistakenly pale blue shade to my eyes, becomes the anchor for a new palette of colors, resulting in another painting of Blue Dogs --- but one completely like no other. It is this endless variety, the same process that inspires him to paint hundreds of imaginary oak trees over the years, that keeps the Blue Dog exciting for George. At this point he’s broken so many rules in art that there are none left worth worrying about. 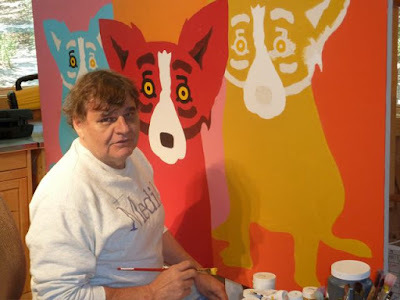 He found his own path years ago, resulting in several unique series of works which, whether Cajuns, Blue Dogs, Hurricanes, or Bodies, are recognizable as paintings by George Rodrigue. “If I lose this case, then I’ll never paint again,” he commented, a direct challenge to the original intention of copyright protection. “But why?” asked the judge. Coming this Saturday: "There is No Bacon in Space (Having Fun Discussing Art)"
I really enjoyed seeing this painting evolve through the images and your words. Another great post by my personal favorite blogger. Loved the photos and the blog. Great pictures! I know what he's talking about, sometimes I sit down to start painting or drawing, and someone will ask "What are you going to do?" Lots of the time my answer is, "I don't know..." That is hard to explain to someone else. I love this picture. 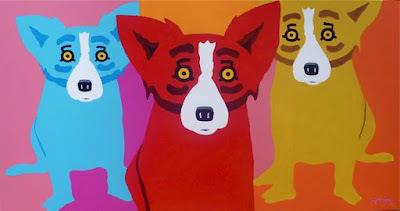 I would know a George Rodrigue anywhere! He stands out from the crowd! As he creates, he creates happy when viewed by me. George, I LOVE your work,your color of your," BLUE DOG" are my favorite,I love your Gallery the brightness of the color,your choice in the gold frames, just lovily.I have only been painting for a year and a half,after I broke my neck I lost some of my ability to spell sometimes, peoples names also ,but I started to paint and one of my paintings was a copy of your Blues Brothers minus the Blue Dog,I felt it could only be yours, my paintings are mostly from my imagination and I never know how the painting is going to turn out, it could take a whole different direction, my colors are bright also. I would love if you would take a peek at my painting on Facebook under Gloria Zwaan. Hoping to meet with you some day ,my brother is in La.The nicest of people there! Thank you so much for the inspiration you have given me!! !Gloria P.S. there is a whole story Behind the Photo I took of you,Blues Brothers Painting, over 10 years ago. thank you again. Thank you for writing in, everyone! Jacqueline, I enjoyed your post about Santa Fe, one of my favorite places. And congratulations on 100 posts. I'm getting close myself, so I know the feeling! Gloria, I tried to find your Blues Brothers image to show George but was unsuccessful (neither one of us is very FB savvy; we leave that to his son, Jacques). Anyway, I'd love to see it and share it, so if you get the chance, please email it to info@georgerodrigue.com.